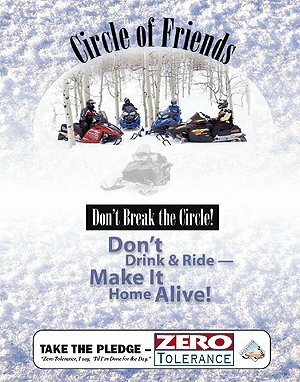 In an effort to eliminate alcohol as a major contributing factor in snowmobiling fatalities and injuries, the snowmobiling community unanimously adopted a “Zero Tolerance” position on drinking and riding. 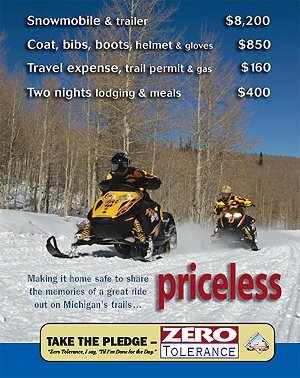 At the International Snowmobile Congress in June, 2002, the snowmobile organizations endorsed a 0.0 percent blood alcohol content as the only acceptable level while riding a snowmobile. The incidence of alcohol involvement in preventable snowmobiling fatalities and injuries is well documented, with the highest proportion of alcohol-related snowmobile crashes occurring at night among 19-34 year old males. 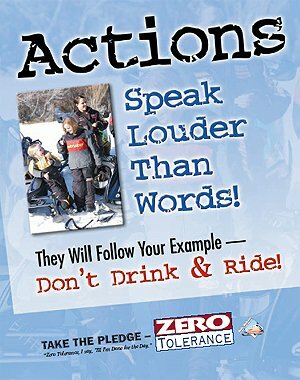 This behavior is unacceptable to most snowmobilers … responsible, family people who do not drink and ride, so the snowmobile community launched the “Zero Tolerance while Snowmobiling Campaign”. It is meant to reinforce and complement existing safety initiatives such as public education, policy/legislation and enforcement already in place in many jurisdictions across the country. One of the images that the general public has about our sport is that all snowmobilers drink alcohol while operating their snowmobiles. And, as we all know, that is not the truth!! This image is perceived due to a high majority of fatal accidents, as well as other accidents, involving the snowmobile operator’s use of alcohol. We need to change this image.